Have you made any plans yet? If you haven’t, why not celebrate the festive season with loved ones at the heritage rich, colonial-style luxury hotel, Raffles Singapore? The hotel’s stalwart dining establishments – Raffles Grill, Tiffin Room, Bar & Billard Room and Long Bar Steakhouse have put together a wide range of dining options this yuletide season. For those seeking an especial Christmas experience, Tiffin Room is the choice pick with its Festive North Indian Curry Lunch and Dinner buffets. What better way to start the dinner than with the legendary Singapore Sling at its birthplace? This year, 2015, marks the centennial anniversary of the iconic gin-based tropical tipple. Concocted to resemble a fruit punch, this seemingly innocuous cocktail; though sweet, zesty and easy on the palate, actually contains 60ml of alcohol. We were served freshly-made naans (plain and garlic) together with Keema Mattar (Minced Lamb Curry with Green Peas). If you are not a fan of lamb, there is a variety of vegetarian and non-vegetarian curries available at the buffet too. Khumb-e-Malai – Juicy, earthy mushrooms enveloped with melted cheese. Served with chilli tomato sauce and mint chutney. Simple yet satisfying. 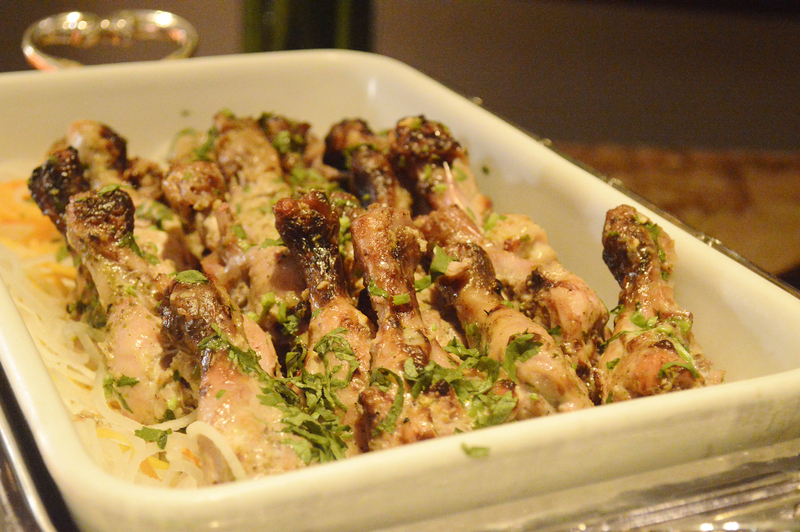 Over at the buffet table, Tiffin Room serves up a wide array of appetisers, salads, chutneys, curries and desserts. Although Tiffin Room specialises in North-Indian cuisine, there is also a small selection of Asian and Western cuisine. Some Asian and Western appetisers include Smoked Salmon, Tuna “Nicoise”, Chicken Vietnamese Spring Roll with Sweet Chili Sauce and a selection of European Cheese with Artisan Breads. Other notable Indian appetisers include Palak Ki Tikki and Kalmi Kebab (shown above). Palak Ki Tikki – Deep-fried spinach patties with spices. Kalmi Kebab – Tandoor Baked Boneless Chicken Flavored with Cinnamon Stick and Bay Leaves. Very tender and bursting with flavours. If you love your greens, there is an assortment of salads with Indian influence. My picks are Achari Prawn Salad and Makai Ka Salad. The former, a seafood salad of shrimps cooked with pickled spices whereas the latter, a corn “salad” with onions and a dash of lemon juice. Tiffin Room offers a variety of vegetarian and non-vegetarian curries. The curries here are thick, moderately spicy and creamy. For meat lovers, try the Murg Makhanwala; butter chicken in smooth tomato sauce. The tender chicken chunks and thick and creamy sauce goes very well with rice and naan. Macchi Ka Salan, a classic Hyderabadi dish where red snapper is cooked in tamarind and a blend of spices, is also recommended. As for the vegetarian curries, I would recommend Dal Makhani. Black lentils are cooked overnight with tomatoes, butter and cream, resulting in a creamy gravy that goes very well with rice and papadums. Other than naan and roti, piping hot Steamed Basmati Rice is served here. I prefer Murgh Dum Biryani though. Basmati rice cooked with chicken, mint, yoghurt, onions and rose water in a sealed pot. Pairs well with butter chicken. Traditional festive favourites such as Glazed Christmas Ham and Roasted Stuffed Christmas Turkey are available at the live carving stations. Glazed Christmas Ham – Thick slices of ham with mustard, ketchup and apple sauce as accompaniments. Roasted Stuffed Christmas Turkey – Turkey stuffed with chestnuts, brussels sprouts, bacon, roasted butternut, green peas with cream, pearl onions with cream, glazed carrots and roasted. This huge golden-brown bird is very flavourful and by far the most tender turkey I have eaten. Served with cranberry sauce. The dessert section comprises of a variety of traditional Indian desserts, Western-style sweets, log-cakes and fresh fruits. Indian desserts are generally very sweet but the desserts here; though sweet, are of acceptable level. Indian desserts available include Rasmalai, Chocolate Burfi, Sago Kheer, Besan Ladoo and many more. My favourite got to be the Bread and Butter Pudding with Brandy Sauce. I like how the bread and butter pudding is served individually. The brandy sauce is a perfect accompaniment to the bread and butter pudding. Traditional Chocolate Log Cake and Champagne Log Cake are also available as part of Tiffin Room’s Christmas offerings. To usher into the new year, Raffles Singapore will also be hosting the New Year’s Eve Gala Ball at the hotel’s majestic lobby. 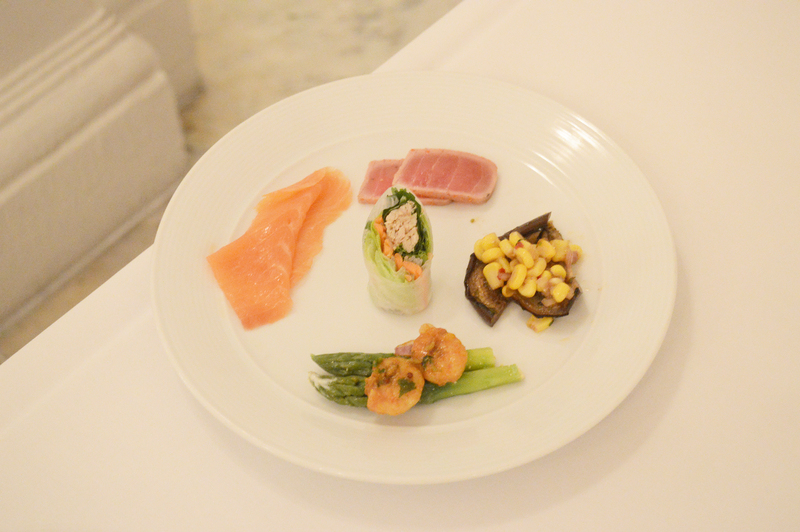 Countdown to 2016 with a 5-course dinner by the hotel’s Executive Chef, Pierre Burgade, as well as a live band and DJ. A four-course dinner will also be available at Long Bar Steakhouse and Long Bar’s New Year’s Eve Bash at $198++ per pax. For more information about the various festive dining options and offers , please visit Raffles Singapore’s website.